Linear Tape-Open (or LTO) is a magnetic tape data storage technology originally developed in the late 1990s as an open standards alternative to the proprietary magnetic tape formats that were available at the time. Hewlett-Packard, IBM and Seagate initiated the LTO Consortium, which directs development and manages licensing and certification of media and mechanism manufacturers. Seagate's tape division was spun off as Certance and is now part of Quantum Corporation. 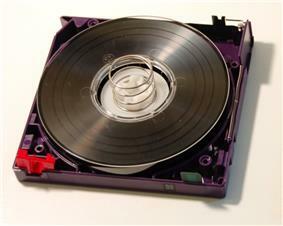 Half-inch (½-inch, 12.65 mm) magnetic tape has been used for data storage for more than 50 years. In the mid 1980s, IBM and DEC put this kind of tape into a single reel, enclosed cartridge. Although the physical tape was nominally the same size, the technologies and intended markets were significantly different and there was no compatibility between them. IBM called its format 3480 (after IBM's one product that used it) and designed it to meet the demanding requirements of its mainframe products. DEC originally called theirs CompacTape, but later it was renamed DLT and sold to Quantum Corporation. In the late 1980s, Exabyte's Data8 format, derived from Sony's dual-reel cartridge 8 mm video format, saw some popularity, especially with UNIX systems. Sony followed this success with their own now-discontinued 8 mm data format, Advanced Intelligent Tape (AIT). Around the time of the release of LTO-1, Seagate's magnetic tape division was spun off as Seagate Removable Storage Solutions, later renamed Certance, which was subsequently acquired by Quantum. LTO Ultrium was developed as a replacement for DLT and has a similar design of ½-inch wide tape in a (slightly smaller) single reel cartridge. This made it easy for robotic tape library vendors to convert their DLT libraries into LTO libraries. As of December 2012 LTO-6 was the latest generation; further generations are planned as tabulated below. ^ Maximum uncompressed speeds valid for full height drives. Half height drives may not attain the same speed. Check manufacturer's specifications. Increased data transfer rate to 160 MB/s (maximum). While specifications vary somewhat between different drives, a typical LTO-3 drive will have a maximum rewind time of about 80 seconds and an average access time (from beginning of tape) of about 50 seconds. 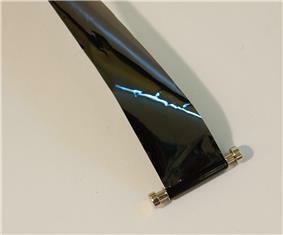 Because of the serpentine writing, rewinding often takes less time than the maximum. If a tape is written to full capacity, there is no rewind time, since the last pass is a reverse pass leaving the head at the beginning of the tape (number of tracks ÷ tracks written per pass is always an even number). With LTFS tape media can be used in a fashion like other removable media (USB flash drive, external hard disk drive, etc.). With LTFS the drive may behave like a disk (drive) but it is still a tape with serial access. Files are always appended to the end of the tape. If a file is removed from the listing the associated tape blocks used are not freed up, they are simply marked as unavailable. Data is only deleted if the whole tape is reformatted. LTFS now supports 'Library mode' facilitating access to multiple tapes in a tape library. 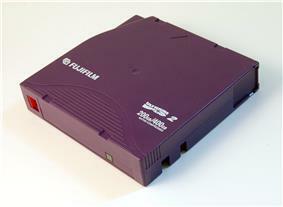 LTFS was first introduced with the IBM LTO Gen5 drive. The Linear Tape File System Technical Work Group of SNIA works on the development of the format for LTFS. LTO-2 cartridge with the top shell removed, showing the internal components. Top right corner: tape access gate. Compliance-Verified licensed manufacturers of LTO technology media are EMTEC, Imation, Fujifilm, Maxell, TDK and Sony. All other brands of media are manufactured by these companies under contract. Since its bankruptcy in 2003, EMTEC no longer manufactures LTO media products. TDK withdrew from the data tape business as of the end of March 2014. Verbatim and Quantegy both licensed LTO technology, but never manufactured their own compliance-verified media. Although keeping a tape drive clean is important, normal cleaning cartridges are abrasive and frequent use will shorten the drive's lifespan. LTO drives have an internal tape head cleaning brush that is activated when a cartridge is inserted. When a more thorough cleaning is required the drive signals this on its display and/or via Tape Alert flags. Cleaning cartridge lifespan is usually from 15 to 50 cleanings. There are 2 basic methods of initiating a cleaning of a drive: robot cleaning and software cleaning. The LTO-4 specification added a feature to allow LTO-4 drives to encrypt data before it is written to tape. All LTO-4 drives must be aware of encrypted tapes, but are not required to actually support the encryption process. All current LTO manufacturers support encryption natively enabled in the tape drives using Application Managed Encryption (AME). The algorithm used by LTO-4 is OASIS's Key Management Interoperability Protocol. As hard disk drive prices have dropped, disk has become cheaper relative to tape drives and cartridges. As of 2013 the cost of an LTO-5 drive taking tapes of up to 1.5 TB true (uncompressed) capacity was about US$1800. As of 2013 a tape cartridge is still cheaper than a disk drive, as a 1.5 TB magnetic tape cartridge costs about US$40 whereas a hard disk drive with the same capacity costs about US$70 to US$100. ^ "Super tape drive shipments double in" (PDF). Archived from the original on 2005-03-06. Retrieved 2013-03-29. ^ "New Freeman Study Projects Major Shifts In Compact Tape — Industry Growth In Units, Revenue Seen" (PDF). Archived from the original on 2005-03-06. Retrieved 2013-03-29. ^ "HP, IBM, And Seagate Agree to Establish Open Format Specifications for Enterprise and Network Storage" (Press release). LTO. November 4, 1997. Retrieved 2007-10-15. ^ "IBM storage history". IBM. Retrieved 2013-03-29. ^ "LTO cartridge specifications". USA: Fujifilm. Retrieved 2013-03-29. ^ a b c "The Linear Tape File System". 2010. ^ a b "Licensing Specs for LTO-6 Available in August, 2012". Micro-Journal / The LTO Program. ^ a b c "Ultrium Generations LTO". Hewlett-Packard, IBM and Quantum. ^ Mellor, Chris (2010-04-15). "Two new LTO tape gens announced". ^ "Fujifilm LTO-6 specifications" (PDF). Retrieved 2013-03-29. ^ Rivera, Rogelio; Vargas, Gustavo; Vázquez, Marco (September 2012), IBM® System Storage® LTO Ultrium 6 Tape Drive Tape Drive Performance White Paper, IBM Guadalajara, This new capacity is achieved in the same tape length (846 m) as the gen5 media due to a higher density format (gen6 format). Note that another IBM announcement disagrees: "This is achieved by increasing the linear density, track density, and the media length." 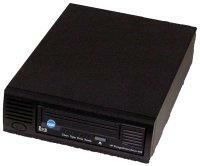 (IBM TS1060 LTO-6 tape drive announcement, p. 3.) Note: the difference on the length from LTO5 and LTO6 media is only 1 m.
^ "LTO-5 Tape Drive User's Guide". Quantum. ^ a b "LTO-6/LTO-5 Tape Drive Datasheet". Quantum. 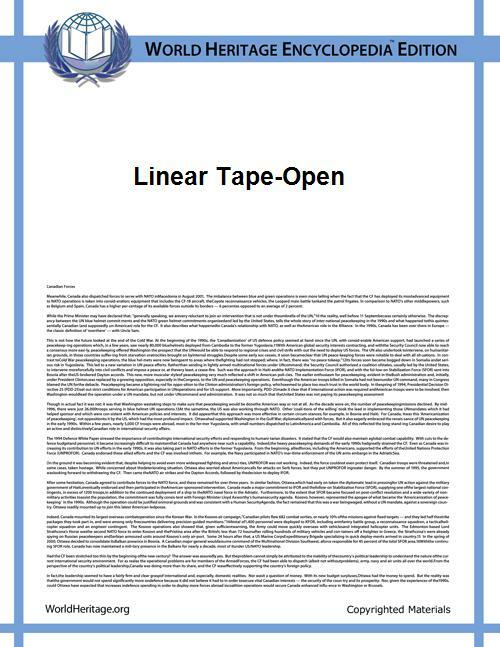 ^ "Linear Tape-Open Program Ships One Million Ultrium Tapes in First 12 Months of Availability for market" (PDF) (Press release). LTO. November 5, 2001. ^ "Standard ECMA-319, Ultrium-1". Ecma-international.org. Retrieved 2013-03-29. ^ "HP, IBM Pass LTO Ultrium Format Generation 2 Mechanism Compliance" (PDF) (Press release). LTO. February 12, 2003. ^ "LTO Program Announces LTO Ultrium Generation 2 Compliance-Verified Licenses" (PDF) (Press release). LTO. March 27, 2003. ^ "Fujifilm, Imation, Maxell, Sony, TDK Pass LTO Ultrium Generation 3 Data Interchange Compliance Testing" (PDF) (Press release). LTO. November 8, 2004. ^ "HP And IBM Pass Mechanism Compliance Testing For LTO Ultrium Format Generation 4 Tape Drives" (Press release). LTO. April 11, 2007. Retrieved 2007-10-15. ^ "Fujifilm, Imation, Maxell, Sony and TDK Pass LTO Ultrium Generation 4 Data Interchange Compliance Testing" (PDF) (Press release). LTO. May 7, 2007. ^ "LTO-5 expected in H1 2010 with 1.6 TB–3.2 TB storage". Geekzone.co.nz:80. Retrieved 2013-03-29. ^ "Trust LTO website". Trustlto.com. Retrieved 2013-03-29. ^ "LTO Program Frequently Asked Questions". Lto.org. 2010-04-04. Retrieved 2013-03-29. ^ Dell PowerVaultTM 110T drive specification. Retrieved 2009-05-16. ^ a b , . ^ a b "Storage tek tape storage media LTO specs". Oracle and Sun. Sun. 2011-10-04. Retrieved 2013-03-29. ^ "Primer 3". Ultrium – LTO Technology. LTO. 2010-04-04. Retrieved 2013-03-29. ^ News bytes (PDF), LTO, Jun 2011 . ^ "IBM LTO Gen5 drive". ^ "Linear Tape File System (LTFS)". ^ "Patent application number 20090208018: Data Transfer Device". Faqs.org. Retrieved 2013-03-29. ^ "Image of Dell LTO-3 WORM cartridge with gray bottom". Support.dell.com. 2012-06-06. Retrieved 2013-03-29. ^ "HP Forum: LTO 3 WORM info". H30499.www3.hp.com. Retrieved 2013-03-29. ^ a b "LTO Compliance-Verified Licencees". Ultrium. Retrieved 2013-03-29. ^ "Notice Concerning Dissolution of Consolidated Subsidiary Due to Business Withdrawal" (Press release). LTO. August 29, 2013. ^ "Emtec, Imation, and Verbatim License Linear Tape-Open Technology" (PDF) (Press release). LTO. August 3, 1998. ^ "Linear Tape-Open (LTO) Technology Continues Licensee Momentum with Signing of Fujitsu and Quantegy" (PDF) (Press release). LTO. October 21, 1998. 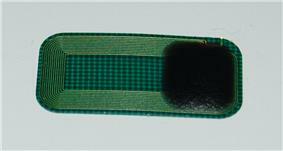 ^ "Black Imation LTO-6 WORM cartridge" (JPEG). Nov 2011. Retrieved 2013-03-29. 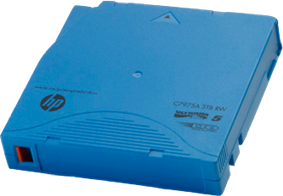 ^ Lt Blue HP LTO5 WORM cartridge, Span . ^ HP LTO‐6 Ultrium tape cartdrige ( . ^ "Slate Blue IBM LTO-4 cartridge" (JPEG). CPU inc. Retrieved 2013-03-29. ^ "TS2350 (3580)" (PDF). IBM. Retrieved 2013-03-29. ^ Dark Red Imation LTO-5 cartridge (JPEG), . ^ "Black Imation LTO-6 cartridge" (JPEG). Storage backup. Retrieved 2013-03-29. ^ "Dark Red Maxell LTO-5 cartridge" (JPEG). ^ "Black Maxell LTO-6 Cartridge" (JPEG). JP: Impress. Retrieved 2013-03-29. ^ "Dark Red Sony LTO-5 cartridge" (JPEG). Sony. Retrieved 2013-03-29. ^ "Dark Red TDK LTO-5 cartridge" (JPEG). Dell. Retrieved 2013-03-29. ^ "Fujitsu Cartridge Memory documentation" (PDF). ^ "VeriTape the trusted Cartridge Quality Analyzer". MP tapes. 2010-06-15. Retrieved 2013-03-29. ^ "Spectra MLM Reader". Spectra logic. 2007-11-15. Retrieved 2013-03-29. ^ "Maxell LTO Cartridge Memory Analyzer". US: Maxell. Retrieved 2013-03-29. ^ Specification of SLDC ( . ^ ALDC documentation, IBM . ^ "Patent claim by Hi/Fn". IETF. Retrieved 2013-03-29. ^ LTO‐3 tape specs, . ^ "Freeman Reports". Retrieved 2013-03-29. ^ "LTO Ultrium Format Maintains Momentum with More Than 1,500,000 Tape Drives and 50,000,000 Cartridges Shipped" (Press release). LTO. September 25, 2006. Retrieved 2007-10-15. ^ "More Than 2,000,000 LTO Ultrium Format Tape Drives and 80,000,000 Cartridges Shipped" (PDF) (Press release). LTO. September 5, 2007. Retrieved 2008-03-13. ^ "LTO Ultrium Format Reaches New Heights with Over 100 Million Cartridges Shipped" (PDF) (Press release). LTO. September 3, 2008. Retrieved 2009-03-10. ^ "LTO Ultrium tape drive shipments cruise past new milestone" (PDF) (Press release). LTO. March 18, 2010. Retrieved 2011-05-17. ^ "Advanced Research, Exabyte, Matsushita, Mitsumi Electric and Otari License Linear Tape-Open Technology". Find articles. Retrieved 2013-03-29. ^ "What Happened to Accellis?". Enterprise storage forum. 2002-09-11. Retrieved 2013-03-29. ^ "Consommables informatiques" [Computer supplies] (EMTEC site offering LTO-1 tape cartridges in multiple sizes) (in French). RPS data. 2005-05-09. Archived from the original on 2005-05-09. Retrieved 2013-03-29.